Every so often the RAZR is able to deliver a startlingly good photo; this is one of them. 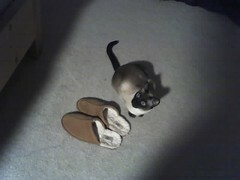 Valentine is such a sweetie in this as she chills out next to my slippers, but the shadows give the image a weird sort of drama. Totally film noir, only with cats. Music: Orbital - "The Sinner"